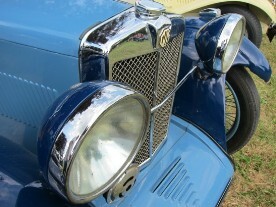 Lucas L140 headlamps (8 inch diameter) were fitted to many British cars of the 1930's to the late 1940's and were introduced to MG part way through the J Type period of production when Rotax merged with Lucas. They were then fitted to many MMM models as well as on the early T Types. The quality of this reproduction lamp is superb, using highly skilled traditional British craftsmanship and are supplied complete to incorporate either frosted flat lenses for J Types, or the original U flute convex lens as fitted to P Types and later models. These headlamps can also be supplied with stone guards which are again, of excellent craftsmanship to incorporate a rather attractive period hinge arrangement on the top of the rim. The table below offers a guide as to which headlamps were fitted to which models. LBD 140 U flute - 8 inch lens TB and TC to 1947. LBD or MBD 140 - 8 inch Catseye Late TC. Lucas S700 - 7 inch TD and TC (USA export). The above table is offered as a guide only and has been collated using information kindly supplied by fellow enthusiasts. Please feel free to email us if there is any missing or incorrect information.